Sunbridge’s 4-week intensive in Waldorf World Language Teacher Education is designed for current or aspiring Waldorf world language teachers. This offering is under the auspices of the Sunbridge Waldorf Elementary Teacher Education program: Jana Hawley, MSEd, director. This intensive is designed to provide Waldorf world language teachers with an informed understanding of the Waldorf curriculum and the anthroposophical view of child development, enabling these individuals to be more fully integrated members of their school community and to meet their students through the lens of a Waldorf educator. This is an every-other-year offering and will next enroll summer 2019. We are now accepting applications for the 2019 cohort. Regular application deadline: May 1; intensive dates: July 8-26. See below for applications and details on the admissions process. During their three-week campus study, Sunbridge world language students focus on the theoretical considerations and practical aspects of world language teaching through the grades. There is additional daily coursework in child development, Waldorf pedagogy, and the arts. While the thrust of the practical activities will be on grades 1-8 teaching, high school world language teachers will also benefit from attending this offering. Reading fundamental texts by Rudolf Steiner and instruction in developing a meditative practice is included in the experience, as is a one-week observation of an experienced Waldorf world language teacher that takes place during the following school year. How to teach world languages in accordance with Waldorf Education. In addition to large group instruction in teaching world languages in general, you will be given opportunities to work in small groups with same-language colleagues, developing and sharing ideas concerning curricular themes, celebrating festivals and practical activities. As a student in the Sunbridge World Language Teacher Education intensive, you will study alongside students from Sunbridge’s three-year Elementary Teacher Education diploma program, many of whom are practicing Waldorf teachers. This academic environment will provide you with the benefit of developing colleagueship among fellow Waldorf educators. Through your studies, you will gain a Waldorf pedagogical understanding of the child and a knowledge of how that understanding relates to world language study. This will lead to a deepening of the curriculum for both you as a world language teacher and the Waldorf class and other subject teachers with whom you work, allowing for a more informed partnership. 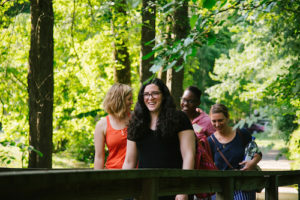 The world language offering is comprised of a three-week on-campus summer study, plus a one-week observation of an experienced Waldorf world language teacher. The required one-week observation of an experienced Waldorf world language teacher will be arranged for a mutually-convenient time and setting during the academic year that follows. Observations must be completed by June of that academic year. Students are asked to bring curriculum ideas (verses, songs, games) to share and discuss. As director, since 2009, of Sunbridge’s Elementary Teacher Education program, Jana Hawley oversees the World Language Teacher Education intensive. Since 2006, she has also been on the faculty of Green Meadow Waldorf School, where she has been a class teacher, music teacher, member of the Teacher Development Committee, and Lower School chair; she currently teaches music and singing in Green Meadow’s Lower School and serves as co-chair of the Festival Committee. Previously, she spent 14 years on the faculty of the Whidbey Island Waldorf School, teaching music and main lessons. Jana has been a visiting faculty member at several Waldorf teacher training institutes in the US as well as at institutes abroad, including China and Australia. She has led workshops in movement, singing, and composition, and is a contributor to The Mood of the Fifth: A Musical Approach to Early Childhood, a WECAN publication. Jana earned her BFA in Music from Cornish College of the Arts, Seattle, WA, and her MSEd in Waldorf Elementary Teacher Education from Sunbridge College. Yolanda Novarro, who joined the Sunbridge faculty in 2018, has more than two decades experience in education. Originally from Barcelona, Yolanda’s focus has been the development of world languages curriculum and its implementation in Waldorf schools. In 2008 she began working at the Brooklyn Waldorf School, where she has served as a class teacher, Spanish teacher and mentor. She has also worked as an educational consultant, teacher trainer, and mentor in the US and Brazil and is currently mentoring world language teachers and researching language immersion programs. Yolanda holds educational degrees and certifications from the University of Barcelona, the School of Waldorf Pedagogy in Madrid, the Center for Anthroposophy, the Instituto Cervantes in Barcelona, and Leadership that Works, and is also certified in Applied Positive Psychology, Life Coaching and Facilitation. Please see our elementary faculty page for bios of other faculty under whom our world language students study. This intensive is designed for those currently teaching world languages in Waldorf schools or those who aspire to become Waldorf world language teachers. Applicants must complete an application form and submit all required application materials, including a letter of reference from someone qualified to speak to your suitability for the vocation of Waldorf world language teacher and your ability to be successful in this intensive. Applicants must possess a high school diploma (a bachelor’s degree is not required). Financial aid is available. Students receive a certificate upon completion. The regular application deadline for summer enrollment is May 1. Applicants are encouraged to apply as early as possible (especially those individuals seeking financial aid). Applications submitted after May 1 are considered on a space-available basis and must contain a late application fee. Applications may be completed online or accessed via a pdf download. Or you may request to have a paper version sent to you by filling out an inquiry form or by contacting us at 845-425-0055 x20. Non-refundable $50 application fee. Applications received without this fee will not be processed. Applications received after May 1 must contain an additional $50 late fee. If applicable, a transcript from your degree-granting institution, or any college attended. Otherwise, a high school transcript or diploma. Once your application is received, we review it for completeness and contact you to arrange a phone interview. Admissions decisions are sent out soon thereafter, on a rolling basis. All applicants whose first language is not English or who have taken their prior education in a non-English-speaking college or university must demonstrate oral and written proficiency in English during the admissions process (through a hand written personal statement and phone conversation). Taking the Test of English as a Foreign Language (TOEFL) or the International English Language Testing System (IELTS) may be required. Read about financial aid opportunities and our refund policy. Sunbridge world language students may now elect to combine their specialized world language studies with matriculation in our Elementary Teacher Education program and receive a Waldorf teacher education diploma with concentration in world language teaching. Matriculation in our elementary program entails meeting certain admission requirements, such as having earned 60 credits from an accredited college or university, and paying full program tuition. If you would like to learn more about this option, please contact Admissions, Alumni, and Summer Coordinator Penelope-Myles Voss (info@sunbridge.edu / 845-425-0055 x20).